The second step to creating a multi-pose rig is to create additional chains. after the creation of the main chain. In the Timeline view, move the playhead (current frame) to the character's next position. 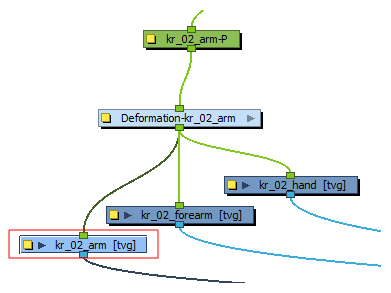 In the Node or Timeline view, select the drawing you want to set a new deformation chain (transformation chain) for. If you had previously selected the upper arm in a multiple parts arm structure, select the same drawing layer (upper arm). Create your new deformer structure—see About Chain Creation.